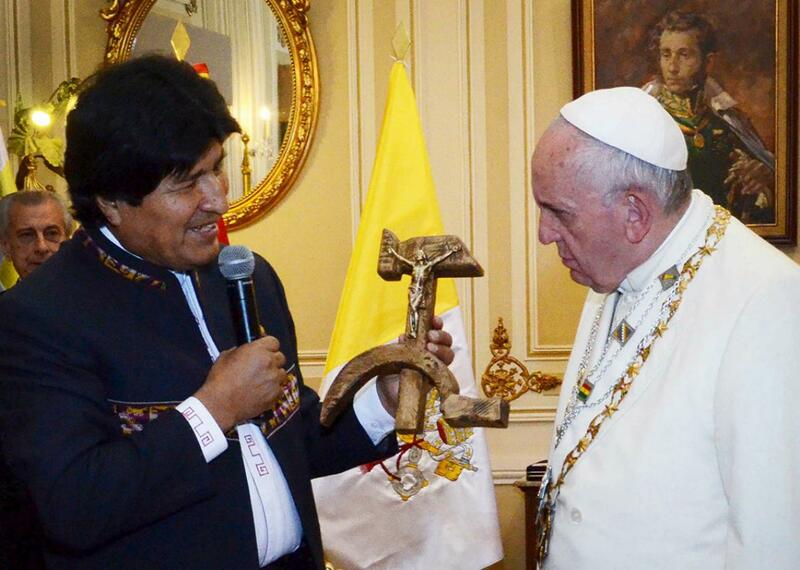 Pope Francis, hammer and sickle cross, Bolivia: President Evo Morales confuses, then explains. Bolivia’s President Evo Morales, left, presents a figure of a crucified Christ resting on a hammer and sickle as a gift to Pope Francis in La Paz, July 8, 2015. However, Morales went on to explain that the gift is a replica of a carving that Spanish Jesuit priest, poet, and filmmaker Luis Espinal Camps made in the 1970s. Espinal was tortured and murdered in 1980 by the Bolivian dictatorship of the time; before the gift presentation the pope, a Jesuit himself, had prayed at the site where Espinal’s body was found. A Vatican spokesman said that the pope was told that Espinal originally made the hammer-and-sickle crucifix in the spirit of dialogue between ideologies, not as an endorsement of Communism. He also said the pope didn’t have a “particularly negative reaction” to the gift. In other pope/Bolivia news, the Holy Father stopped at a Burger King to change clothes before giving a mass in the city of Santa Cruz.